Spearmint, or spear mint, is the common name for a species of mint, Mentha spicata, characterized by oblong or lance-shaped serrated leaves and a tapering cluster of small purplish flowers. This herbaceous, rhizomatous, perennial plant is native to Europe and Asia. It is well-known for an essential oil that is widely used for culinary and medicinal purposes. Other names include sage of Bethlehem, garden mint, Our Lady's mint, and spire mint. Spearmint's aromatic and carminative oil is referred to as oil of spearmint. Carvone, a primary component of the oil, is responsible for the spearmint smell. For the spearmint plant, carvone provides protection against plant pathogens, such as fungi. For humans, spearmint oil is used to flavor diverse products (toothpaste, candy, shaving cream) and in aromatherapy and alternative medicine. Carvone has been used for air freshening products. Wrigley's Spearmint Gum is soaked in carvone and powdered with sugar. Likewise, spearmint leaves, dried or fresh, are used to flavor teas, provide seasoning for various dishes (meat, fish, among others), and so forth, with spearmint tea and tinctures used medicinally for treatment of digestive disorders, improvement of eyesight, treatment and prevention of scurvy, and even to bring a sparkle to dull eyes. Mint julep has spearmint as one of its main ingredients. Spearmint, Mentha spicata, is one of about 25 species of herbaceous plants in the Mentha genus and Lamiaceae family. Members of this genus are aromatic, almost exclusively perennial plants and are known as the mints (or "true mints," to distinguish them from the other members of the mint family, Lamiaceae). The true mints are characterized by wide-spreading, underground rhizomes; paired, oppositely arranged leaves; small, tubular flowers arranged in clusters, and square stems. All Mentha species are characterized by an essential oil (volatile oil) in resinous dots in the foliage. Spearmint is a species of mint native to much of Europe and southwest Asia, though its exact natural range is uncertain due to extensive early cultivation. It grows best in rich, wet soils and semi-shade (Blamey and Grey-Wilson 1989; Hanrahan and Frey 2005). Spearmint is a hardy perennial herb that grows to about 30 to 100 centimeters (12-39 inches) in height and has a wide-spreading fleshy underground rhizome. The leaves are bright green, veined, about 5 to 9 centimeters (2-3.5 inches) long and 1.5 to 3 centimeters (0.6-1 inches) broad, with a serrated margin, that is unevenly toothed. The stems and foliage range from hairless to hairy. Spearmint produces small flowers in slender spikes, clustered at the tip of the green or purple stem, and tapering to nearly a point. The central spike may be flanked by one or more flowering stems. Each flower is from pale to deep violet in color and about 2.5 to 3 millimeters long and broad. Each of the small, tubular flowers has two long and two short stamens. The seeds are tiny, round, and brown (Blamey and Grey-Wilson 1989; Hanrahan and Frey 2005; Huxley 1992). There are many Hybrids involving spearmint. Peppermint is an aromatic, natural hybrid, Mentha × piperita, that is a cross between watermint (Mentha aquatica) and spearmint. Other hybrids with spearmint include Mentha × gracilis (ginger mint, syn. M. cardiaca; hybrid with Mentha arvensis) and Mentha × villosa (large apple mint, hybrid with Mentha suaveolens) (Blamey and Grey-Wilson 1989). A major component of the essential oil of spearmint is R-carvone; pure R-carvone is sufficient to produce a smell that people identify as a spearmint smell (Leitereg et al. 1971). (Carvone forms two mirror image forms or enantiomers, with S-carvone smelling like caraway.) Carvone is a member of a family of chemicals called terpenoids (Simonsen 1953). The name spearmint derives from the pointed leaf tips (Turner and Hibberd 1568). Spearmint grows well in nearly all temperate climates. While thriving in rich, moist soil, and in semi-shade (Hanrahan and Frey 2005), spearmint can grow in full sun to mostly shade. It is best suited to loamy soils with plenty of organic material. Gardeners often grow it in pots or planters due to its invasive spreading roots. Spearmint leaves can be used whole, chopped, dried and ground, frozen, preserved in salt, sugar, sugar syrup, alcohol, oil, or dried. The leaves lose their aromatic appeal after the plant flowers. It can be dried by cutting it just before, or right (at peak) as the flowers open, about 1/2 to 3/4ths the way down the sock (leaving smaller shoots room to grow). There is some dispute as to what drying method works best; some prefer different materials (such as plastic or cloth) and different lighting conditions (such as darkness or sunlight). The essential oil is typically extracted by steam distillation. There are different cultivars. The cultivar Mentha spicata Nana, the Nana mint of Morocco, possesses a clear, pungent, but mild aroma and is an essential ingredient of Touareg tea. 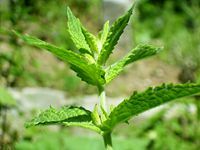 The fact that spearmint spreads rapidly by underground runners may result in their becoming troublesome weeds in a garden. They also are regarded as an invasive weed in parts of the United States, although in some areas of the United States it is raised as a cash crop (Hanrahan and Frey 2005). Since ancient times, spearmint has been known as a herb of hospitality, and has been used for both culinary and medicinal purposes (Hanrahan and Frey 2005). Both the essential oil and the leaves are used for culinary purposes. The oil is used as a flavoring for toothpaste, confectionery, chewing gum, shaving cream, liqueurs, and medicines, and is sometimes added to shampoos and soaps. Spearmint leaves are used to flavor teas, soups, and stews, with the dried leaves used to season meat (such as lamb), fish, and vegetable dishes (Hanrahan and Frey 2005). Spearmint also serves as an an ingredient in several mixed drinks, such as the mojito and mint julep. In early America, spearmint tea was a popular drink at the time of the American Revolution because it was not taxed by the English and spearmint was important as a cash crop in Connecticut. The tea also was popular during the Civil War, when the imported black teas were not as readily available (Hanrahan and Frey 2005). Fresh and dried leaves and the essential oil are used medicinally. Spearmint is steeped as tea for the treatment of digestive disorders, stomach ache, colic, and flatulence as a result of its carminative and antispasmodic properties. 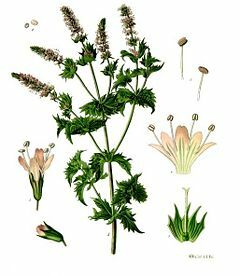 It is used for relief of nausea and motion sickness, and is a diuretic that is said to be useful in cases of painful or suppressed urination. Applied externally, a few drops of essential oil applied to skin is said to relieve itching, insect bites, burns, and other skin irritations. Diluted with almond or sunflower oil, it can be used as massage. (Allergies in some people have been reported.) Spearmint's high vitamin A and vitamin C content has been used to prevent and treat scurvy, improve eyesight, and reduce night blindness, as well as bring a sparkle to dull eyes. It may have anti-bacterial properties as well (Hanrahan and Frey 2005). Recent research has shown that spearmint tea may be used as a treatment for mild hirsutism in women. Its anti-androgenic properties reduce the level of free testosterone in the blood, while leaving total testosterone and DHEA unaffected (BBC 2007). BBC. 2007. Tea "controls female facial hair growth." BBC February 20, 2007. Retrieved January 5, 2009. Blamey, M., and C. Grey-Wilson. 1989. Flora of Britain and Northern Europe. London : Hodder & Stoughton. ISBN 0340401702. Hanrahan, C., and R. J. Frey. 2005. Spearmint. In J. L. Longe, The Gale Encyclopedia of Alternative Medicine. Farmington Hills, MI: Thomson/Gale. ISBN 0787693960. Huxley, A. 1992. New RHS Dictionary of Gardening. Macmillan. ISBN 0333474945. Leitereg, T. J., D. G. Guadagni, J. Harris, T. R. Mon, ,and R. Teranishi. 1971. Chemical and sensory data supporting the difference between the odors of the enantiomeric carvones. Journal of Agricultural and Food Chemistry 19(4): 785. Retrieved January 5, 2009. Simonsen, J. L. 1953. The Terpenes, 2nd edition, volume 1. Cambridge: Cambridge University Press. Turner, W., and S. Hibberd. 1568. The First and Seconde Partes of the Herbal of William Turner Doctor in Phisick: Lately Ouersene, Corrected and Enlarged With the Thirde Parte, Lately Gathered, and Nowe Set Oute With the Names of the Herbes, in Greke Latin, English, Duche, Frenche, and in the Apothecaries and Herbaries Latin, With the Properties, Degrees, and Naturall Places of the Same; Here Vnto is Ioyned Also a Booke of the Bath of Baeth in England, and of the Vertues of the Same With Diuerse Other Bathes, Moste Holsom and Effectuall, Both in Almanye and England. Imprinted at Collen, by the heirs of Arnold Birckman. This page was last modified on 20 January 2009, at 01:10.